Australia’s alpine ecosystems are extremely vulnerable to future climate changes. This is due to their small geographical extent, high degree of sensitivity, relatively modest seasonal snow cover and depth, and high diversity of flora and fauna, many of which are already threatened. It is predicted that Alpine regions will experience an 18-66% reduction in snow cover by 2030, and a 39-96% reduction by 2070. Such outcomes will have a seriously adverse impact on Alpine regions and their communities, and will greatly increase the risk of fire in sensitive areas previously largely devoid of fire. Overall, decreased snow and rainfall and increased temperatures caused by climate change will leave very little opportunity for Alpine ecosystems to adapt. These changes vary seasonally and across the south east Australian region, influenced by elevation, aspect and distance from the coast. Climate change and the alpine environment (from Protect our Winters, a USA-based organisation). The Alps could become snow free by 2050. News report from The Age. Climate change and other threats in the Australian Alps (paper by WWF). Education kit on climate change and the Alps. 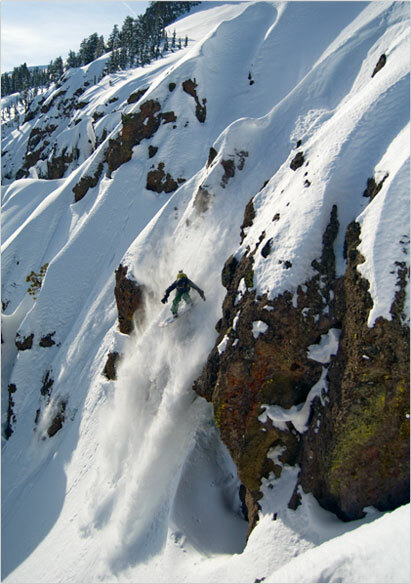 The following is an opinion piece from snowboarding legend Jeremy Jones. This has been widely published in newspapers across the USA. Here in Victoria, we have a promise from the state government to deliver a Climate Change Bill. This type of sentiment – and activism – from prominent Australian skiers and boarders would bring a new dimension, perspective and sense of urgency to the climate change debate here. The impacts of climate change are often highlighted with far-off and dramatic examples: the loss of the polar icecap, rising sea levels and unpredictable seasonality. But for those of us living and working in mountain communities throughout the United States, the effects can be felt and seen much closer to home — in the form of shortened winter seasons resulting in lost tourism revenue, incomes and jobs. Climate change and the boom or busts of winter are realities that mountain communities now live with each season. What might come as a surprise though, is the scale of importance winter recreation plays in the national and local economies. In a 2006 Southwick Associates study, snow-based recreation in the United States was estimated to contribute an estimated $66 billion annually to the U.S. economy and support approximately 556,000 jobs. More than just an abbreviated ski and snowboard season, continued loss of snow will exact a significant economic toll on the mountain communities that have developed alongside U.S. ski resorts. From Maine to California, hotels, restaurants, hotels, shops and thousands of other small businesses all rely on the draw and the economic inputs of snow sports to maintain their vibrancy and welfare. The prime ski conditions of the Rockies attract about 35 percent of all U.S. skiers every season. Snow sports recreation contributes 11 billion to the regional economy, annually and support over 100,000 jobs. If conditions decline due to warmer temperatures, the region would loose a major source of revenue. A relatively “normal” winter climate is a necessary ingredient for many local commodities beyond the ski hill, including maple syrup in the North East, trout fishing in Montana, and agricultural irrigation in California. I founded the non-profit, Protect Our Winters to unite the snow sport’s community and industry in a fight to curb climate change. A few weeks ago, I joined a snow sports coalition on Capitol Hill to share our perspective on the importance of protecting winter from the effects of climate change, in order to maintain the economic vitality and culture of our mountain communities. While we met with a great response and connected with many allies, it became clear that the American Clean Energy and Security Act, which passed through the House last year, is in danger of being held up in the Senate. The bill aims to cut America’s production of greenhouse gases by 17 percent by 2020, and 83 percent by 2050. It will create millions of new jobs and move the U.S. towards a new, clean energy economy, while protecting the winter season that fuels our passions. It’s an amazing step forward, but now this landmark legislation is currently in the Senate’s hands — and for a bill that could be decided by one or two votes, holdouts will make all the difference. The general opinion is that any new climate change legislation needs to be passed by the Senate within the next 60 days or we run the risk of losing any momentum gained, and witnessing a very different future. So now is the time to collectively reach out to our senators, and ask that they approve climate change legislation, starting us down the road to a proper regulation of the emissions that are warming our planet, shortening our winters, and threatening our local economies. My hope and goal in writing this is that all of us who live in mountain communities around the U.S. will recognize the unique stake and voice we have in making sure this legislation is passed and take action. We have a lot at stake and a powerful voice, which needs to be heard. For information on Protect our Winters, check here. Did you ever consider that in order to meet the IPCC’s emission reduction targets, western economies will be hit so hard that the average person will have to forget about skiing completely. Of course the elite such as people conected with the UN and other carbon trading entities will have the ski resorts to themselves but that wont include the likes of you and me. Constructing a low-carbon economy can generate employment rather than reduce it. All a question of how you approach it. The transition is painful, because any change in a complex system has negative effects to some. But with proper planning, that can be eased. Farriers and drafthorse studs suffered when the car became king. Well, now the car has to die, mechanics need to be replaced by new professions and trades to look after the new essentials of life. Living a low-impact lifestyle involves local work. This means that production and service become decentralised, generating local employment. The multinationals will suffer, and my heart bleeds for them. There might be some green employment generated, but if you ever passed your Economics 101 you would be able to see with half a glance that they most certainly would not replace the jobs lost by this “transition” you talk about. Of course people might find they will be happy to work for less (a lot less) than they are used to, and so be employable that way, but they certainly wont have any money to spare to go skiing. If you dont like multinationals, why dont you try living without purchasing any multinational products or services.